There’s nothing quite like that first skydive, when everything is brand new and you’re experiencing something you’ve never experienced before. It’s an amazing thing to do. It’s something you’ll want to remember forever, and to share with your loved ones, too. By choosing to get a video made of your jump, you’ll have something you can look back on yourself and that your friends and family can watch, so they can feel like they were there too! Here’s everything you need to know about getting a skydiving video, and be sure to check out our video services page for prices and bookings. What is a skydiving video? A skydiving video is a video made of your jump that you can keep to remember your experience by for years to come. A skydiving video is captured in two ways, either using a handcam, or by a freefall camera person. Handcam is the name for the small camera our tandem skydiving instructors wear on their hands. A freefall videographer is a skydiver whose job it is to wear a camera on their helmet and film your whole skydive for you, from a short interview on the ground to shots on the airplane ride up, your exit from the airplane and all of freefall. They’ll even grab you on the ground for a reaction shot! The only thing you miss with an outside camera is the parachute ride, as the camera person is on a separate parachute. But the benefit is that the angle is further away than handcam, meaning you can see your whole body and the sky and ground around you too, giving a great sense of position. Each skydiving video is different. With handcam, the video you get depends on you primarily, and how much you interact with the camera – and, most importantly, smile! For outside camera, it’s a bit more creative. These are professional skydiving videographers who take great pride in their work – plus, they’re super awesome flyers themselves, which means they’ll sit right in front of you to film you as you fall, as well as flying around you to show how high up you are and to capture some of our exquisite views. This might mean your video is a little different to your friend’s, but it makes sense, right – unique videos for unique experiences! Can me and my friend share a skydiving videographer? If choosing handcam, your instructor will wear the camera on his/her hand and only be able to capture you. When you choose outside camera, you get a dedicated camera person who will film your experience for you. They sit in front of you in the sky in freefall and fly around you to capture the whole experience. That means they can only film on skydiver at a time. It’s also a safety requirement, as we have to have adequate distance between our tandem skydivers, which makes it impossible for the camera person to film more than one at a time. Why choose to get a skydiving video? The main regret we hear from our tandem skydiving customers is that they didn’t buy a skydiving video. Once you’ve experienced the jump, you’ll undoubtedly want to share it with everyone you know and post it on your social networks, but without a video, there’s no way to do that! You’ll receive your skydiving video and be able to upload to YouTube, Facebook, Wistia etc and to share it via email or simply gather round the TV and watch together. Do I also get photos? Yep! Choose the handcam package with stills photos or the outside video and stills package and you’ll get both a video and photos from your jump. Bring on your next Facebook profile picture! 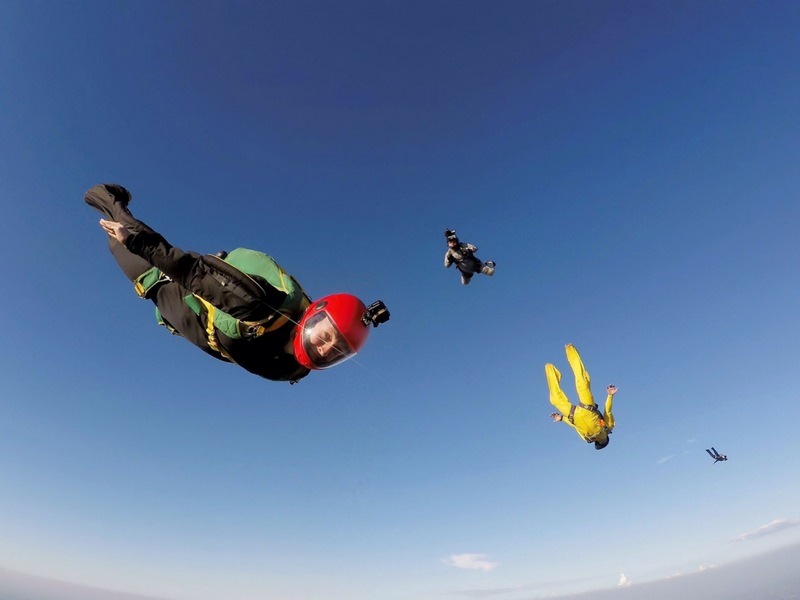 Booking your skydiving video/photos is simple! Check out our prices here, and book online today.